#Color Chess: In #Color Chess, play is completely normal except that it is not necessarily ended by mate or by any number of mates. Whenever either side mates, the color of the mating piece is changed; if a legal position results, play continues normally with the mated side making the next move. Einstein Chess: Units ‘grow’ when they capture (P→S→B→R→Q→Q) and ‘shrink’ when they move without capturing (Q→R→B→S→P→P). Castling is permitted with reborn Rook but the Rook changes to a Bishop. 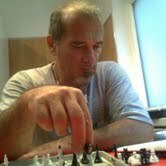 If a white (black) Pawn on 7th (2nd) rank make a non-capturing move, it does not change its status, i.e. remains a Pawn and loses its mobility. If the Pawn captures, it changes into Knight. The white Pawn on 1st rank can make five(!) moves: two captures and three forward moves. For example a white Pawn on c1 can capture on b2 and d2 and can move to c2, c3 and c4. The same rule applies to the black Pawn on the 8th rank. Two en passant moves are possible after the white Pawn plays, for example, from c1 to c3 or from c1 to c4. The same goes for black Pawn moves. After en passant moves the capturing Pawn disappears and the captor becomes a Knight. Rules for neutral and half-neutral Pawns: on the 1st rank the Pawn can be moved only by White, while on the 8th rank only by Black. Einstein Chess is not defined for play with other fairy pieces.